During Spain's New World Empire, its mainland coastal possessions surrounding the Caribbean Sea and the Gulf of Mexico were referred to collectively as the Spanish Main. 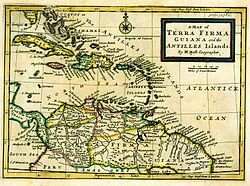 The southern portion of these coastal possessions were known as the Province of Tierra Firme, or the "Mainland province" (as contrasted with Spain's nearby insular colonies). :15 The Province of Tierra Firme, or simply Tierra Firme, was also called Costa Firme. In 1509, authority was granted to Alonso de Ojeda and Diego de Nicuesa to colonize the territories between the west side of the Gulf of Urabá and Cabo de la Vela, and Urabá westward to Cabo Gracias a Dios in present-day Honduras. The westernmost portion was given the name Tierra Firme. 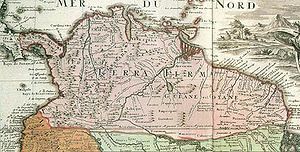 Other provinces of this region during this era were Nueva Andalucia and Veragua or Castilla del Oro; the main city in Tierra Firme was Santa Maria La Antigua del Darién, now Darién, Panama, near at mouth of the Tarena river. The idea was to create a unitary administrative organization similar to Nueva España (now Mexico), near the Captaincy General of Guatemala. Tierra Firme later received control over other territories: the Isla de Santiago (now Jamaica) the Cayman Islands; Roncador, Quitasueño, and Providencia and other islands now under Colombian control; and the territories of present-day Costa Rica and Nicaragua as far as Cabo Gracias a Dios. The eastern frontier of Tierra Firme also included the east side of the Gulf of Darién or Urabá, the east side of the Atrato and Truando rivers, ending in Cabo Marzo on the Pacific side. Between these limits lie Santa Maria La Antigua Del Darien on the Gulf of Urabá and Jurado on the Pacific side. When the Central American states gained independence, the precise frontiers were unclear. For example, some ancient maps and historical references suggest that the entire Caribbean coast as far as Cabo Gracias a Dios was part Tierra Firme or Castilla Del Oro. On the other hand, this would embrace populated regions of the Mosquito Coast that were never under the effective rule of Tierra Firme. Disputes over both of Panama's frontiers were finally solved by agreements with Costa Rica and Colombia, respectively. Tierra Firma item Nuevo Reyno de Granada atque Popayan, map showing this usage (and giving both spellings). The map is from L'Histoire du Nouveau Monde ou description des Indes Occidentales, contenant dix-huict livres... enrichi de nouvelles tables geographiqiues & figures des animaux, plantes & fruicts by Joannes de Laet (1593–1649), published 1640 by Bonaventure & Abraham Elseviers, Leiden. Lucien N.B. Wise, Le Canal De Panama, L Isthme Americain explorations : Comparaison des Traces Etudies, Nnégociations; Etats des Travaux, Libraire Hachette Et C, Paris, 1886; (Tr Spanish:"El Canal De Panama, Itsmo Americano. Exploraciones; Comparaciones de los trazados Estudiados; negociaciones; estados de los trabajos, Published by Loteria Review N°4, Imprenta "la Academia", Panama, 1956.
el Portal de la Música Típica[permanent dead link], section: - "Recordando La Guerra de Coto en el Centenario de Panama" (In Spanish.) Portal for "typical" music (characteristic of Panama): "Remembering the Coto War on the Centenary of Panama". ^ Ilia del Toro Robledo. Actas del Cabildo de Ponce, Puerto Rico. Ponce, Puerto Rico: Gobierno Municipal Autónomo de Ponce. Comisión Puertorriqueña para la Celebración del Quinto Centenario del Descubrimiento de America y Puerto Rico, en Conmemoración del Encuentro de Dos Mundos. 1993. Acta # 136 of 28 October 1821. p. 207.